Nice tip to the old "breaded pork is from ARE COUNTRY" meme. Id be curious to find out what Clutch charged for that tenderloin which to my eye looks like it spent a little to long in the deep fryer. I dont hink I have paid over $6 for any of the spots I go to. Last edited by jimswside on May 18th, 2010, 10:58 am, edited 3 times in total. In this thread I would like to keep away from schnitzel and spaetzle. Looking for the all American, born in the USA, Breaded Tenderloin Sand-wedge. Kinda like the creeping in of milanesa on the Breaded Steak thread. Next thing you know we'll be checking for papers when someone mentions toriten in the fried chicken thread. Let's just say some milanesa/schnitzel/cutlet - toting EU-types introduced something like this to Japan back in the Shogun days, but it took an American icon to put it on bread and show them how it's done. Sometimes it does distract from the goal of the hunters, dilutes the thread. I do know that Chicago has some of the best milanesa and schnitzel that can be found anywhere! Some of the hunted items are not native to this area but Chicago being one of the, if not the best, area for almost anything there is always hope that these specialty items can be found (and often are). but sometimes folks need to tip their hat to an area that specializes in an item that isnt done well in Chicago, in this case a proper/affordable pork tenderloin sandwich. Some of the best stuff on here comes up through such diversions. Also, while we are short on taverns selling a sandwich that is very common in Indiana, most of Illinois and Iowa, one really can get a good breaded, fried pork tenderloin sandwich at Resi's and other German places. I'd bet Aloha Eats could also make a swell sandwich using their pork katsu. Hope I didn't muddy the waters. Guess I'm not clear on the distinction (if any, other than language and vernacular) between a breaded pork tenderloin and a wiener schnitzel. As for milanesa, I don't know if that's also considered a different thing here. In Chile a breaded pork tenderloin can be listed on the menu as an escalopa or a milanesa or a chuleta (though, of the three, chuleta alone also refers to a thicker, unbreaded pork chop - in Chile, anyway). Cbot wrote: In this thread I would like to keep away from schnitzel and spaetzle. Looking for the all American, born in the USA, Breaded Tenderloin Sand-wedge. I'm not all that interested in the iconic American pork tenderloin sandwich, but I will respect the OP's desire to keep schnitzel out of the thread. Since the thread got me in the mood for breaded pork though, I headed over to Kamehachi for a nice rendition of tonkatsu. This hit the spot, though there are other versions I like better - with larger panko flakes and a bit more seasoning. The sweet and tangy worcestershire-style tonkatsu sauce was nice. Might look even better hanging off the sides of a cheap white bun and breaded in crushed saltines instead of panko. Maybe some lattice fries on the side. the link to davydd's site has already been listed a couple times on this thread, he also posted alot info on the 'Surviving in Ottawa" & "Pursuing the breaded pork tenderloin " threads in the Beyond Chicagoland area. Yeah thats what I was thinking...looks good. And can someone throw out a post about the difference between the BPT and schnitzell. I got to get get a sammy or pizza soon...LOL, GO HAWKS. Game on soon!! The tenderloin is not the only muscle in a pig that can be sliced, pounded and breaded. Pork schnitzel or milanesa may use tenderloin or other cut. 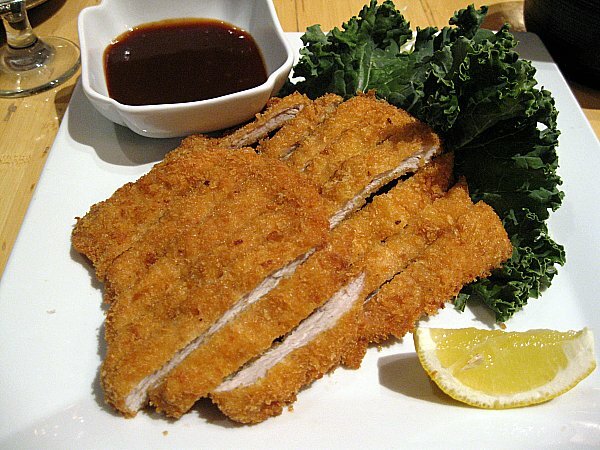 I have had some very good breaded pork cutlets under whatever name that were not tenderloin. I utilize shoulder when I make schnitzel at home. G Wiv wrote: The hand pounded, in-house, pork tenderloin was quite good, crisp, greaseless and substantial '"bun overlap", a very satisfying sandwich. Pickle and onion lent a nice contrast, and the fries were good, though needed to be crisper to move up to very good. The Silo pounds their pork quite thin and the breading, while substantial, and crisp, does not overpower the pork. The Silo's Iowa style pork tenderloin was certainly worth the drive to Lake Bluff, a very good sandwich that, if I lived or worked in the area, would be on my regular lunch line-up. Even though the pork tenderloin is getting all the press everyone I've mentioned the Silo to has commented on the pizza. The Silo is known for pizza, which, as we did not try, or even see served, I have no comment on. Ok lets focus on the BIG prize local breaded pork tenderloin sammys...I know there has to be a few hidden gem'z out there...right? The Silo looks right on the money with that tender-LOIN! The Silo's version was big, beautiful and so dry it was nearly a choking hazard. I wanted to love it but my wife is a Hoosier, so I've had some really good ones over the years and this one didn't come close. Maybe I just caught them on a bad day. ronnie_suburban wrote: The Silo's version was big, beautiful and so dry it was nearly a choking hazard. I wanted to love it but my wife is a Hoosier, so I've had some really good ones over the years and this one didn't come close. Maybe I just caught them on a bad day. I don't think so. It was just as dry and awful when I had it. Burger King's is better. We attempted to try BK's version yesterday at their Highland Park store on Skokie Boulevard. They didn't have them yet and had absolutely no idea when they would. Anyone dared to try Burger King Debuts Fire-Grilled Ribs yet? I saw a sign for them yesterday at a BK in the south suburbs. One (not really) mention of Chicago? If you ever make it to Chicago, there is a town about an hour west called Peru. The Igloo in Peru has one of the best tenderloins I have ever had. The sandwiches are not thick, but they are special. It takes two to fill you up, but the last time I was there they were only around $3 each. The place is an old drive-in, and I believe you can still get car side service. They don’t have a website. That whole area is full of great small family restaurants. Panther in the Den wrote: Interesting! If you ever make it to Chicago, there is a town about an hour west called Peru. You better drive pretty fast if you want to get to Peru in an hour. I average 98.1 mph all the time. What are you driving? (note: do not link Silas Jayne's car). Peru takes me about 30 minutes to get there, and I live out that way. I'm surprised no one has mentioned the fact that some of the better Polish deli's in Chicago always have freshly made pork cutlets in the deli case that can be warmed up and served to order. Nuking isn't my favorite way to warm up a pork cutlet but it works in a pinch. Kasia's on Chicago Ave. is OK but usually a little dry. I prefer Gene's Polish deli on Belmont. They always have huge, thick pork and chicken and sometimes veal breaded cutlets which I usually take home and warm up in a fry pan with a little butter. They will make a sammy for you there of course. I like it with mayo and lots of their beet and horseradish relish. Oh Yea! I always come out of the place with about $ 80 worth of cut deli meats too. Their sausage is usually underwhelming in my opinion. I'm more of a German sausage kind of guy I guess. I spent 4 months last year working in the LaSalle/Peru area and wanted to try some of the places mentioned on here and by the locals and I found a place that was, in my opinion, rather good. It's the Water Street Pub. To paraphrase Bruce Springsteen...You can hear 'em in the back room pounding...and they deliver a tenderloin sandwich that is very satisfying. Certainly, much better than at the Igloo which seems to get a lot of love simply because of their longevity. PJ Murphy wrote: I spent 4 months last year working in the LaSalle/Peru area and wanted to try some of the places mentioned on here and by the locals and I found a place that was, in my opinion, rather good. It's the Water Street Pub. i have heard of Water Street but have yet to make it in. Thanks for the recommendation.